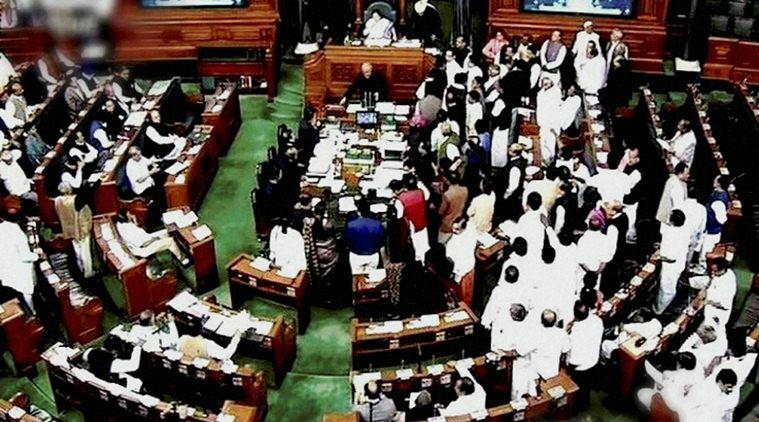 Generally, the first hour of a sitting of Lok Sabha is devoted to Questions and that hour is called the Question Hour. It has a special significance in the proceedings of Parliament. It is through questions in Parliament that the government remains in touch with the people in as much as members are enabled thereby to ventilate the grievances of the public in matters concerning the administration. Questions enable Ministries to gauge the popular reaction to their policy and administration. A Starred Question is one to which a member desires an oral answer in the House and which is distinguished by anasterisk mark. When a question is answered orally, supplementary questions can be asked thereon. Only 20 questions can be listed for oral answer on a day. An Unstarred Question is one which is not called for oral answer in the House and on which no supplementary questions can consequently be asked. To such a question, a written answer is deemed to have been laid on the Table after the Question Hour by the Minister to whom it is addressed. It is printed in the official report of the sitting of the House for which it is put down. Only 230 questions can be listed for written answer on a day. In addition to this, 25 more questions can also be included in the Unstarred List relating to the States under Presidential Rule and the total number of questions in the list of Unstarred Questions for a day may not exceed 255 in relaxation of normal limit of 230 questions. A Short Notice Question is one which relates to a matter of urgent public importance and can be asked with shorter notice than the period of notice prescribed for an ordinary question. Like a starred question, it is answered orally followed by supplementary questions. The Question to a Private Member is addressed to the Member himself/herself and it is asked when the subjectmatter of it pertains to any Bill, Resolution or any matter relating to the Business of the House for which that Member is responsible. For such Questions, the same procedure is followed as in the case of Questions addressed to a Minister with such variations as the Speaker may consider necessary or convenient. Where answer to a question whether Starred or Unstarred needs elucidation on a matter of fact, any member can table a notice for raising Half-an-Hour Discussion thereon. If the notice is admitted and gets priority in ballot such a discussion may be allowed by the Speaker. Normally, such discussions are held on three days in a week, viz., Monday, Wednesday and Friday except in Budget Session when such discussion is normally not held till the financial business is completed. The discussion is usually held from 17.30 to 18.00 hrs. A member gives notice in writing addressed to the Secretary-General, Lok Sabha, intimating his intention to ask a question. Besides the text of the question, the notice states clearly the official designation of the Minister to whom the question is addressed as also the date on which the question is desired to be placed on the list of questions for answer as also the order of preference, if any, for its being placed on the list of questions when a member tables more than one notice of questions for the same day. The normal period of notice of a question is not more than twenty-one and not less than ten clear days. A short notice question can be asked with a notice shorter than ten days, but the member has to state briefly the reasons for asking the question at short notice. On receipt of the notice of a question it is scrutinised to see that the designation of the Minister and date of answer have been correctly mentioned in the notice. A preliminary ballot of identical questions is held and the member who obtains priority is deemed to have tabled the question. A ballot is then held in respect of notices received in this Secretariat at the same time to determine their inter se priority. Separate ballots are held for starred and unstarred questions. Starred, unstarred and short notice questions are numbered separately and entered in separate diaries on computer software. The next stage is to examine the question as to whether or not it is admissible under the rules and past precedents. A question is primarily asked for the purpose of obtaining information on a matter of public importance. Questions that contain arguments, inferences or defamatory statements or otherwise refer to the character or conduct of any person except in his official or public capacity, are not admitted. Questions which are in substance repetitions of those that have been answered previously or in regard to which information is available in accessible documents or in ordinary works of reference are also not admitted. Besides, if the subject matter of a question is pending for judgement before any court of law or any other tribunal or body set up under law or is under consideration before a Parliamentary Committee, the same is not permitted to be asked. Questions making discourteous references to foreign countries with whom India has friendly relations are disallowed. Similarly, questions raising larger issues of policy are not allowed for it is not possible to enunciate policies within the limited compass of an answer to a question. Questions containing more than 150 words or relating to a matter which is not primarily the concern of the Government of India are not admitted. Questions going into minor details of administration and day-to-day working of the Government/Organisations are also not admitted. Keeping the above rules and precedents in view, a question is admitted or disallowed. Typed copies of the admitted and edited questions are then made out on a standard form. An advance copy of the admitted question is informally collected by the Ministry/Department concerned so that they may on their side initiate the action for collection of information asked for in the question to prepare a reply. A Short Notice Question which is of wide public importance is first referred to the Ministry concerned if necessary for furnishing factual information in the matter and also for indicating whether the Minister concerned accepts the short notice and, if so, what date will be convenient to him to answer the question. If the Minister accepts the short notice and the matter sought to be raised is considered by the Speaker, urgent, the Short Notice Question is admitted and printed in a separate list on the light pink paper in order to distinguish from lists of ordinary questions. The Short Notice Question is taken up after the Question Hour. Immediately on the fixation of the dates of sittings of a session of Lok Sabha, allotment is made of the days available for the answering of questions relating to the various Ministries of Government of India. For this purpose the various Ministries are divided into five Groups and fixed days are allotted to groups of Ministries during the week. There is no Question Hour on Saturday, if a sitting is fixed for that day. Separate lists are prepared for starred and unstarred questions which have been admitted. Admitted questions are entered in the List of Questions for the day for oral or written answers as the case may be, in the order of priority obtained in ballot with the orders of the Speaker. Not more than five questions are admitted in the name of a member for each sitting of which not more than one is put down for oral answer. While compiling the list of unstarred questions, care is taken to see that one question of each member is included in the list of questions of that date. The remaining unstarred questions are thereafter put in the list according to inter se priority obtained in the ballot. A serial number is allotted to each question. Normally not more than twenty questions are placed on the list of questions for oral answers and not more than two hundred and thirty questions are placed on the list of questions for written answers on any one day. The Ministries are supplied with the lists of finally admitted questions at least 5 days before the date fixed for asking the questions. The member whose question has been admitted and which is included in the list of questions for oral answers for a particular day, rises in his/her seat when the turn of his/her question comes and asks his/her question by reading out its number on the list of questions. The Minister concerned answers the question. Thereafter the member who had asked the question can ask only two supplementary questions. After him/her the second member whose name is clubbed on the question is allowed to ask one supplementary question. Thereafter, the Speaker allows one supplementary each to members who are able to catch his eye. The number of such members depends on the importance of the question. Then the next question is taken up. The replies to questions not reached for oral answer during the Question Hour are deemed to have been laid on the Table of Lok Sabha. At the end of the Question Hour, i.e. after the questions for oral answer have been answered, Short Notice Question, if any, for that day is taken up and disposed of in the same way as the questions for oral answers.